Late last year, right before our trip to Maui, I tried out Timbuk2s Build Your Own Bag site. Ordering up his and hers bags in the Hugga Comfort colors. The bag builder offered very nice interactivity, with lots of custom features, previews, and more. I was initially bummed to see that 992 other bag builders created the bag I did, but then kept trying and got this message: “this color combination has been created just once.” An original bag … cool. While the Bag Builder works well, I’d like to see it have persistence. It doesn’t remember you, if you leave and come back. I’d also like to edit what I created or duplicate it and for it to send me what I made and let me download it. As for the bag, like all the Timbuk2s messenger bags I’ve owned, it’s well made (note that I only purchase the models handmade in San Francisco). The medium size fits well in the S&S case snug under the wheel. It’s filled with bike parts, tools, a saddle bag, etc. When I travel, I compartmentalize everything and all of the pockets, zippers, and pouches support that. For trips with the Dahon, I use the much larger Crumpler bag (also in Hugga Comfort colors) and fill it with clothes and bike gear. 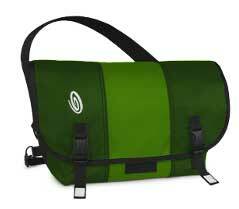 Both Timbuk2 and Crumpler make quality bags, but with a different design aesthetic. Where the Timbuk2s are rugged and urban with lots of zippers, the Crumplers offer a cleaner, more designy style without zippers. One issue with Timbuk2s bag is “floppiness.” That’s the less-than technical description for what happens when you load a bag and it falls over. My older Timbuk2 bags with thicker, heavier materials were sturdier and more rigid and didn’t flop. I liked the bag, but was repeatedly frustrated by the fact that it’d fall over when loaded with a laptop. There’s probably an equation for bag material density, rigidity, and floppage. I suggest they flop less.